I’ve been thinking a lot about how work is done in my class. 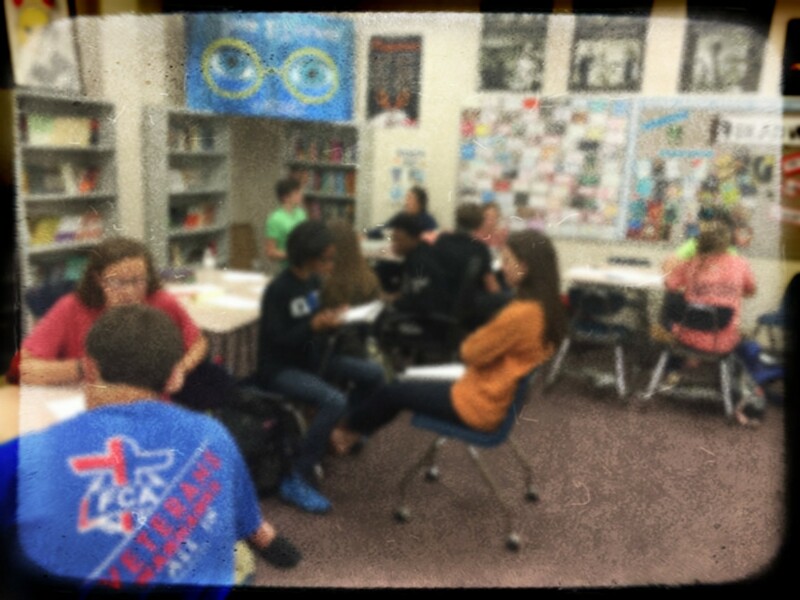 I love the time I have with my students when we meet in the middle to learn a new skill or new strategy. I love listening during work sessions when they are trying out their skills and strategies in their work. I love conferencing with students and having meaningful conversations about their struggles and celebrations in their reading and writing. These are all necessary and vital parts of my classroom. But I also love when students discover learning on their own with only gentle nudges from me. This was the type of thinking and learning we focused on this week. We are writing narratives, more specifically memoirs. Students have worked hard to get their ideas down on paper and write a complete draft. And they have done this more or less successfully. Let’s be honest, this is not the first narrative they’ve ever written. I wouldn’t be surprised if some of them are recycling that token memory they’ve used in several previous grades for narrative work. But I wanted them to lift the level of their writing. 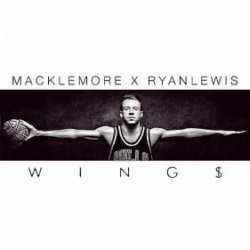 I made copies of an excerpt from the first chapter of Geoffrey Canada’s Fist Stick Knife Gun and the lyrics to Macklemore’s Wings. (Full disclosure: I was introduced to both of these texts through Mary Ehrenworth, one of my heroes in life, during a Teacher’s College workshop. There are so many uses for these texts!) I did a read aloud of Fist Stick Knife Gun. We talked briefly (really briefly) about this te xt and how it fit our definition of memoir. Then I asked students what craft moves did Canada make that really worked well in his writing? I would love to tell you that my students were shouting out ideas so fast I couldn’t keep up as I furiously jotted on our anchor chart. But that didn’t happen. It was quiet. Silent, actually. “I like that part too! But what did Canada do in his writing, what craft move did he make, that makes us, the reader, like this part?” I responded. And then waited some more. “He uses dialogue that sounds like a kid. His words are more like that of small kids, so you know he is telling it from that perspective,” another student chimed in. We worked through a few more craft moves with this piece in the same manner—asking the students to think about the writer’s craft and the impact of the craft. We watched Wings and talked about what visual craft moves we could mimic in our writing as well, listing these on chart paper. Then I gave students a text set with more memoirs (the texts that I used are listed at the bottom of the blog). They worked together to read through these memoirs (they had been exposed to several of these already) and added craft moves they found to our chart paper. 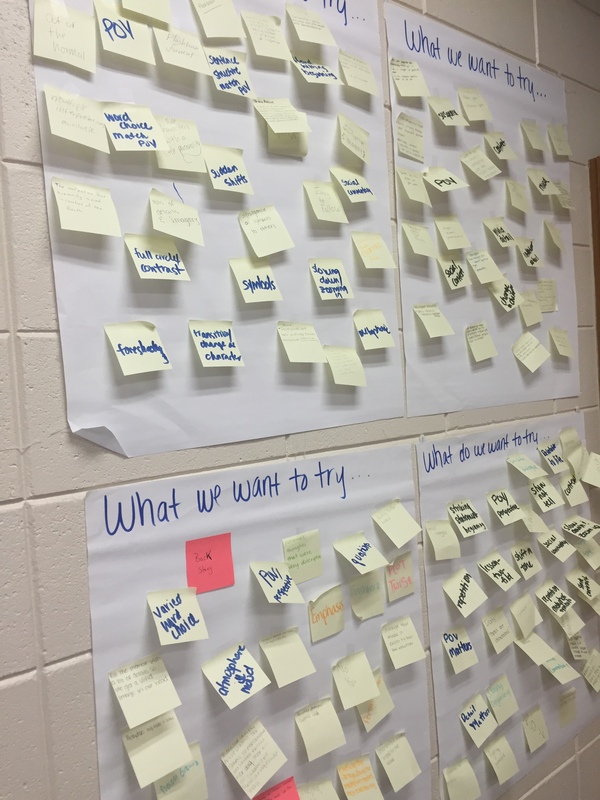 The next day I posted the charts from all the classes on the wall and asked students to select two moves they wanted to try out in their writing. Later in the week, we repeated a version of this with leads and conclusions. 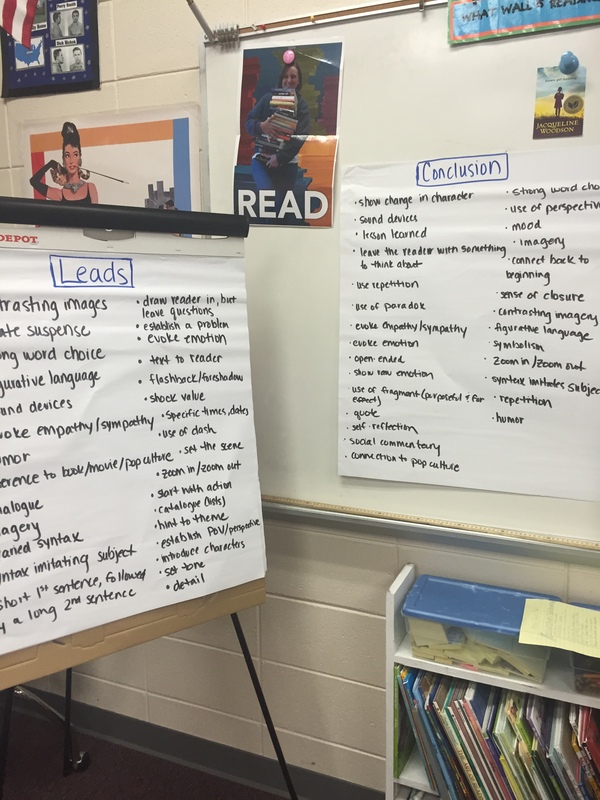 Instead of just taking a few notes on leads and conclusions, students developed their own list of craft moves for effective leads and conclusions. Then they decided what might work for their memoir. Students were engaged with many mentor texts that they could use as references. Students were reading like a writer. Students were learning to talk the expert language of writers. Students took ownership of the craft moves they wanted to try in their writing. 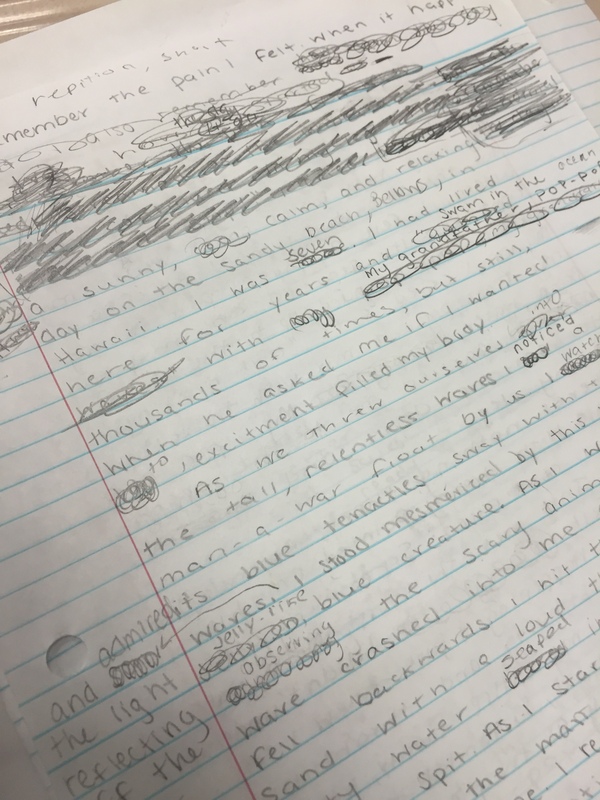 Students’ writing was lifted through the work in a meaningful way. Students discovered way more craft moves than I could have shown them in a mini-lesson. Students were self-assessing their writing using the mentor texts. I was most pleased with the conversations I overheard during their work sessions or when the students met with me for writing conferences. Brenden: My dialogue is trash. It’s not real at all. I’m going to go back and rework it. Samareia: I tried changing my point of view to when I was a kid, but I didn’t like it. I think it made it confusing, so I’m going to tell it in flashback. Darrell: I think I used the same word like 50 times in here. I need stronger words. Savannah: I realized I wrote too much about other stuff that wasn’t important. I want to zoom in on the small moment and elaborate more. Audrey: I really liked how powerful the use of repetition was. I want to try that out. I’m going to do several small moments and use repetition to tie it together. A note about wait time: This wouldn’t have been as effective if I had jumped in during the silence. Students need wait time to process, to think, to formulate responses–especially when doing new or rigorous work. Silence is okay. Let the moment hang there to give students time to work through the question. If we, as teachers, always give the answers after a few seconds of quiet, students will learn they don’t have to process or think, they just have to wait out the teacher. Bonus Read: So many feels when I read Amy’s My Classes are Only 45 Minutes—How Do I Do Workshop? post on the Three Teacher’s Talk blog. Like Amy, this is a question that I wish I had an answer to many years ago. I’ve done a lot of trial and error (and still do) to find the right balance in my 50-minute class period. This post provides much wisdom and many resources. I recommend this post to all teachers in all stages (even haven’t started) of workshop. There is something for everyone here. “When I was first trying to figure it out, the best advice I got was from Penny Kittle. She told me: ‘You choose to do this, which means you choose not to do that.’” I recommend this read for any teacher at any stage (even not started) of the workshop integration. **Many of these texts and other great ones can be found in The Moment: Wild, Poignant, Life-Changing Stories from 125 Writers and Artists Famous & Obscure, edited by Larry Smith.